CONGRESS ENACTED the first federal minimum wage in 1938. A provision of the Fair Labor Standards Act, it covered about 6 million workers and set a wage floor of 25 cents per hour. It also cost a lot people their jobs. The Labor Department reported that as many as 50,000 employees, mostly poor Southern blacks, were thrown out of work within two weeks of the law's taking effect. In the months that followed, the carnage spread. "African Americans in the tobacco industry were particularly hard hit," wrote David Bernstein in his 2001 history of labor regulations and black employment. "In Wilson, N.C., for example, machines replaced two thousand African American tobacco stemmers in 1939." The economic pain inflicted by that first minimum wage law hasn't stopped Washington from repeating the same folly over and over. In the 74 years since the lowest hourly wage at which most Americans could lawfully be hired was set at 25 cents -- the equivalent in purchasing power of about $4 today -- Congress has raised the amount 22 times. The federal minimum wage is currently $7.25 an hour, and a push is underway to raise it yet again. On Capitol Hill, Iowa Senator Tom Harkin has introduced legislation that would hike the minimum wage in three steps to $9.80 per hour, a 35 percent increase. A more radical proposal by Representative Jesse Jackson Jr. of Illinois would increase the wage floor immediately, to $10 per hour. Yet no matter how much politicians and activists may battle over minimum-wage laws, the real minimum wage in this country has never budged. It is $0.00. According to the Bureau of Labor Statistics, that is the hourly wage being earned right now by 12.7 million Americans -- the 8.2 percent of the work force that is currently unemployed. The pain of unemployment isn't evenly distributed among all population groups. It is much more severe among those with the least experience and skills. As of last month, the unemployment rate for black Americans had climbed to 14.4 percent; among teenagers it reached nearly 24 percent. And the unemployment rate for black teens -- the least-skilled, least-experienced subset of the workforce -- was 44 percent. 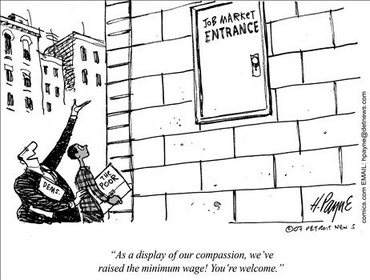 Minimum-wage laws are typically thought of as a mandate on employers. In reality they constrain employees. As it stands now, the federal wage law tells workers that unless they can find a company willing to pay them at least $7.25 an hour, they can't get a job. That may not seem like much of a barrier to Harkin, one of Congress's wealthiest members, but it might as well be the Berlin Wall to an unskilled teen or young adult with no high-school diploma or employment history whose labor is only worth, say, $5.50 an hour. No matter how much that person might leap at the chance to work for what he's worth, the minimum wage forbids it. Should Harkin's bill become law, life will become even harder for those seeking entry-level employment. With the best intentions in the world, lawmakers cannot raise the value of anyone's labor to $9.80 an hour (or $7.25 an hour, or even 25 cents an hour) merely by passing a law. Making it more expensive to hire workers who are just starting out doesn't advance beginners' prospects; it worsens them. Decades of economic research and empirical studies confirm what common sense should tell anybody: Boost the minimum wage beyond what low-skilled workers are worth, and more low-skilled workers will be priced out of a job. 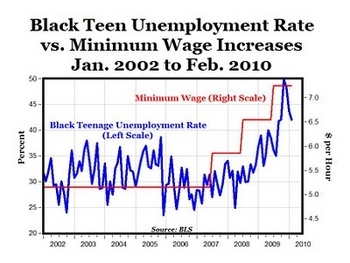 That is why minimum-wage hikes are historically so devastating to those at the bottom of the economic ladder. Minimum-wage laws are not cost-free. When legislators raise the price of low- and unskilled labor, it's usually low- and unskilled laborers who end up paying the price. As 50,000 Americans found out in 1938, jacking up the minimum wage turns the least employable into the unemployable. It may not be easy to survive on $7.25 an hour. But life gets a whole lot harder when your hourly wage is nothing.